At least one Gamma Ray Burster is found within 33 Mega-lightyears (Mly). This distance (10 Megaparsec) contains the local cluster of galaxies but no other clusters. It specifically excludes any early-universe objects (i.e. quasars which have distances >1000Mly) as the source. My interpretation of this claim is that convincing evidence of a "recent" gamma ray burst nearby would satisfy the claim. The sum of the distance (in light-years) plus age (years since the gamma rays reached earth) of the burst event would have to be less than 33 million. If there is consensus of the scientific community that evidence of such an event has been detected, the claim shall be judged YES. If there is no such consensus, the claim shall be judged NO. May 6, 1998: After nearly 30 years of intense debate and scientific inquiry, scientists finally know the answer to the question "Where are the Gamma-Ray Bursts? ", and can now move on to answer the question "What causes them?" Recent discoveries in this field by a collection of international astronomers, including the announcement today of a high-redshift burst, have demonstrated that these bursts are from the most remote parts of the universe. An update (17 May 2002). The latest evidence is that gamma ray bursts are caused by supernovae of large spinning stars; the bursts are only visible when viewed from the axis of the spin. From off axis a normal supernova is seen. I quote below from this article from New Scientist which cites an article submitted to the Astrophysical Journal. Consequently, these objects are not necessarily as energetic as was thought. If this becomes the consensus of the scientific community, and it appears that such a supernova has occurred in our spacetime neighborhood with high probability (even if the Earth was not on the axis at the time), then I will consider this claim satisfied. The link between mysterious gamma ray bursts and huge supernova explosions has finally been nailed. Astronomers have wondered for decades what causes gamma ray bursts (GRBs). They are most violent explosions in the Universe, unleashing high-energy gamma rays and originating billions of light years from Earth. Likely culprits were thought to be supernovae, giant stars that explode after running out of fuel, and black holes. Although astronomers have seen light characteristic of supernovae coming from the same position as GRBs in the sky, they have never been able to confirm this was not a coincidence. 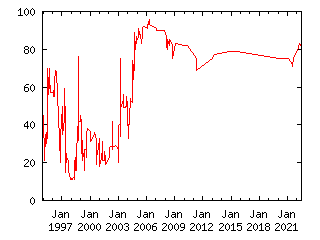 Now a team lead by Kris Stanek at the Harvard-Smithsonian Center for Astrophysics in Cambridge and Peter Garnavich of the University of Notre Dame have done this by tracing the afterglow of GRB 011121 which occurred in November 2001. In work submitted to the Astrophysical Journal, Stanek says the afterglow faded quickly over several hours, but then brightened a couple of weeks later and faded again, just as would be expected if the burst was part of a giant supernovae. "We were thrilled to be the first to catch a supernova 'in the act,'" he says. When a giant spinning star begins to collapse, theory predicts that it shoots out bright jets, which radiate high-energy gamma rays along the axis, and cool and fade quickly. When the bulk of the star later collapses, atoms will be forced into each other and rebound outwards, causing a second brightening. "But sometimes the jets aren't pointing towards us and so we just see a normal supernova," explains Tom Matheson of Harvard-Smithsonian. GRBs lasting longer than two seconds are widely thought to be triggered by the collapse of a massive star into a black hole. As matter falls toward black hole, some of it forms jets in the opposite direction that move near the speed of light and produce a blast of Gamma rays as they emerge. "For more than two decades, the leading model of short GRBs was the merger of two neutron stars. Only now can we show the merger of neutron stars actually produces an ultrastrong magnetic field structured like jets needed for a GRB," Bruno Giacomazzo at NASA''s Goddard Space Flight Center said. Several GRBs are recorded every day, coming from all directions. Most originate in the very distant universe. A GRB burst closer than 10 light years could trigger a mass extinction on Earth. Another burst on July 9, 2005 was noted by the HETE-2 satellite, an international project run by NASA. It lasted just a tenth of a second, but was the first event for which an accurate distance is known. An afterglow of optical light from the same location was spotted by other telescopes, representing the first visible light ever associated with a short-duration burst. At a billion light-years away, it was about 10 times closer than nearly all other recorded GRBs.